Hey! Yeah, hi. Here I am. Over here...with the easiest, most delicious recipe for sweet potato hash browns...? Ya see me? Yeah. Hey. I know a lot of people like to make roasted sweet potatoes for breakfast. The fancier of this ilk will even go so far as to make a "hash" of sorts. But I think we can all agree that hash browns are the penultimate use of tubers at breakfast. I don't know why it only recently occurred to me to shred sweet potatoes, but better late than never, right you guys? AHHH!!! What is tha--oh. Oh god. That's my hand! Anyway, the secret to getting the perfect, crispy hash browns is to get out as much of the moisture as you can, so...that's what I'm doing here. And then all you have to do is toss them in a pan with a little bacon fat and fry them up until they soften and brown. *I realize suggesting there is only one thing harder than making these is in direct opposition to the theme of this post, but it was late and my brain only works when it isn't looking at words, but, like, you get it???! 1. Peel sweet potato and then grate on a box grater. I used the side that looked like it would make normal sized cheese shreds. 3. Add fat to a skillet over medium heat. 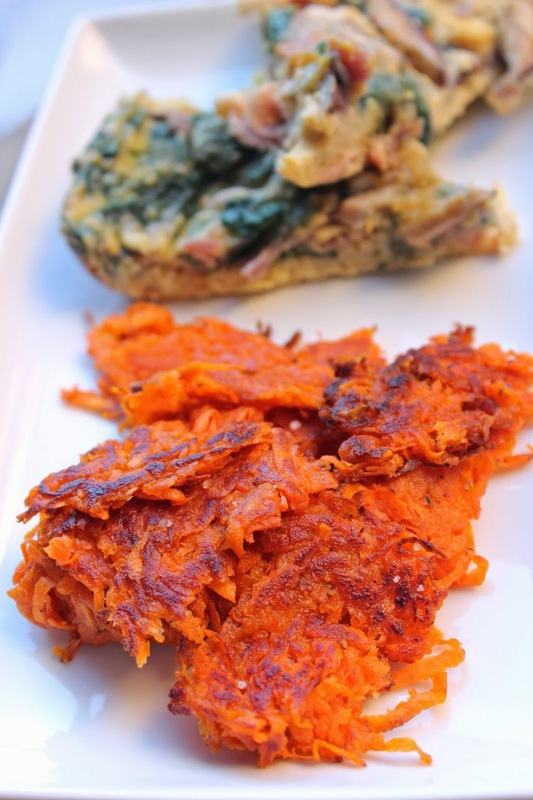 Once melted, add shredded sweet potato in a thin, even layer. Cook until crispy and browned on both sides--about 4 minutes or so depending on your stove. 4. Remove hash browns from pan and set on another paper towel lined plate. While hash browns are still hot, sprinkle generously with salt to taste. Serve hot with additional breakfast foods. Well these look amazing. And you made me laugh when you surprised yourself with your hand. Also, I'm only 25 but I can't relate to Girls at all. Still love it, though. I think it's probably for the best that we can't identify with any of the characters.